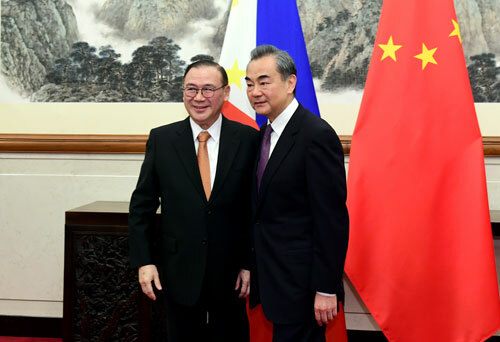 On March 20, 2019, State Councilor and Foreign Minister Wang Yi held talks with Foreign Secretary Teodoro Lopez Locsin of the Philippines at Diaoyutai State Guesthouse in Beijing. Wang Yi said that under the care and guidance of the two heads of state, China-Philippines relations have gone through a trilogy of turn-around, consolidation and improvement in the past three years. Last November, President Xi Jinping's state visit to the Philippines achieved a complete success, elevating China-Philippines relations to comprehensive strategic cooperative relations and bringing bilateral relations to a new development stage. The two sides have continued to deepen political mutual trust, achieved fruitful results from practical cooperation, actively explored maritime cooperation, worked together to maintain peace and stability in the South China Sea, boosted cooperation in three major pillar areas of security, development and people-to-people and cultural engagement, and made steady progress in jointly building the Belt and Road Initiative, constantly pushing bilateral relations for improvement and upgrading. Wang Yi pointed out that as the country coordinator for the relations between China and the Association of Southeast Asian Nations (ASEAN), the Philippines has actively advanced China-ASEAN relations and regional cooperation in East Asia, for which the Chinese side highly appreciates. 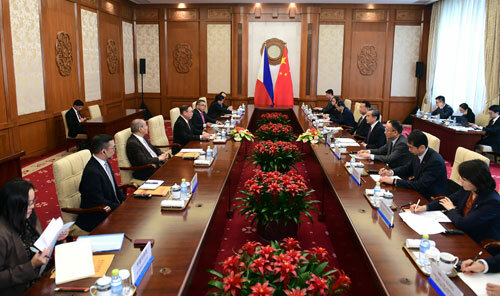 The Chinese side is willing to work together with the Philippines and other ASEAN countries to strive to complete the consultation on the Code of Conduct (COC) in the South China Sea in three years, actively discuss and sign cooperation documents under the Belt and Road Initiative, deepen cooperation in smart city, reinforce cooperation in people-to-people and cultural engagement including cooperation between youth, elevate China-ASEAN cooperation in defense, and endeavor to finish the Regional Comprehensive Economic Partnership (RCEP) negotiations within the year, so as to push China-ASEAN relations to new levels. Teodoro Lopez Locsin said that sharing a long-time friendship, the Philippines and China have always been good friends and have never been enemies. China has never interfered in other countries' internal affairs and never used its strengths or advantages to pressure neighboring countries. No country brings hope to the world like China. China's unique advantages in system enable China to achieve incomparable development achievements. The leadership of the Communist Party of China has played an irreplaceable role in this regard. In history, Western countries pressured developing countries by means of colonialism and imperialism, while China's Belt and Road Initiative has boosted its own development in tandem with common development and common prosperity of other countries. Teodoro Lopez Locsin expressed that President Rodrigo Duterte is looking forward to attending the second Belt and Road Forum for International Cooperation in China next month. The Philippine side is willing to, together with the Chinese side, consolidate political mutual trust, deepen cooperation in various areas, jointly explore maritime cooperation, maintain maritime peace and stability, and constantly promote bilateral relations for new progress. The Philippine side will well play the role of country coordinator for China-ASEAN relations and actively push forward the COC negotiations, in a bid to promote the friendly cooperative relations between the ASEAN and China for new progress.